There were some who wondered just how thrilling or suspenseful a film could be if its final act was already as famous as a suicide mission can get, but the minds behind Rogue One: A Star Wars Story never lost faith. Telling the tale of the brave Rebels who stole the plans to the first Death Star out from under the Empire's nose, the film had the challenge of filling in a blank in the Star Wars timeline, while also delivering enough nostalgia - and enough innovation - to entertain fans both old and new. For the devoted followers of the galaxy far, far away, that means a TON of easter eggs, cameos, impossibly small details, and substantial connections to A New Hope and the films that preceded it. We've done our best to break them all down, to guarantee no Star Wars fan misses out on a single surprise the filmmakers intended them to enjoy. Needless to say, there will be SPOILERS in our look at Rogue One: Every Star Wars Easter Egg & Connection. The Star Wars universe is, at this point, as beloved for its tiny, insignificant minutia as much as its fantasy archetypes or Skywalker saga. And no fan-favorite detail better exemplifies that fact than the drink of choice first spotted at the dinner table of Luke's Uncle Owen and Aunt Beru. Sure, "blue milk" may not be the most appetizing of beverages to the eye, but considering how successful the family is at surviving in an inhospitable environment, we have to assume it's nourishing, at the very least. And it isn't just desert families that subsist on the stuff, as Rogue One makes sure to include a pitcher of the periwinkle dairy sitting in plain sight as Lyra and Galen Erso hurry to pack up their belongings in the film's opening sequence. Although he makes his debut off-camera, plenty of Star Wars fans knew exactly who Forest Whitaker's wheezing, mechanical extremist would be before he ever showed his face. The legacy of 'Saw Gerrera' preceded him thanks to an appearance in the fifth season of the animated Clone Wars, in which Saw's already-extreme methods established him as something of a loose cannon. That was decades earlier in his freedom-fighting career, long before his organs or limbs had been replaced, or he had anchored himself as a figure of legend on Jedha. The connection between film and TV series may not have been as substantial as some would have hoped, but seeing Saw's career come to an end at the business end of the Death Star is as memorable an exit as a Star Wars character can really hope for. It may be hard to look away from the man himself - or his blend of NASA spacesuit and Mad Max-level life support - but those who do can get a look at the set decorators' own tribute to director Gareth Edwards. His path to the helm of the very first Star Wars anthology film came through the success of Monsters and Godzilla, and his crew made sure to mark that ascension in Rogue One itself. Keep an eye peeled on the walls of Saw's cave complex, and you'll catch a glimpse of wall paintings depicting the massive title creatures of Monsters and the 'Mutos' that did battle with Godzilla himself. Apparently, the additions were made without Edwards' knowledge. Fans of the franchise are definitely used to seeing action set on unfamiliar worlds, but Edwards doubles down on the new setting of "Jedha" by littering the horizon with what is clearly a massive, crumbled statue of a Jedi, lightsaber extended. Shockingly, no mention is ever made of the feature, or why such a monument once stood on what appears to be a backwater world. Thankfully, the answers were made available in other releases tied to the film. Established as one of the very first worlds on which the nature of The Force was explored, Jedha became a site of great spiritual significance for Force Users. That millenia-old tradition drew pilgrimages from any who sought the wisdom of The Church of The Force - but it was the moon's abundance of lightsaber-powering kyber crystals that made it important to the Empire. Despite being set in the same period of Star Wars history, the links between Rogue One and Star Wars Rebels aren't too numerous. On the bright side, one of the few bits of fan service is hard to miss - and guaranteed to delight Rebels enthusiasts. During one of the many exchanges between the Rebel leadership, radio chatter can clearly be heard making mention of "General Syndulla." That gives the fans two distinct possibilities to debate: the namedrop could be a reference to Cham Syndulla, a leading Twi'lek resistance fighter whose path crossed that of Anakin Skywalker and Obi-Wan Kenobi in Clone Wars. But even better is the chance that it's a nod to his daughter, Hera Syndulla, star of Rebels - who has apparently worked her way up to the top of the Rebel Alliance's leadership. Even in a story whose ending is known by all in attendance, there can be some big surprises. In Rogue One, one of the biggest twists is the presence of Grand Moff Tarkin - considering that Peter Cushing, the actor who first played him passed away in 1994. The same trick had been pulled off in Revenge of the Sith, though limited to a single shot of actor Wayne Pygram in heavy prosthesis. This time around it's CG to thank, grafting Cushing's facial features onto the body of actor Guy Henry, longtime veteran of the stage and screen who may be best known to wide audiences for his performance as 'Pius Thicknesse,' the Death Eater/Minister of Magic in Harry Potter and the Deathly Hallows. You thought you had to actually be power player in the galactic landscape, and not just a throwaway background character to earn a Rogue One explanation piece? As we mentioned before, it's often the smallest, strangest beats in the original Star Wars trilogy that claim the most legendary status, and the same goes for the pair of troublemaking patrons in the Mos Eisley Cantina. Even die-hard fans won't know that the two are actually named Ponda Baba and Dr. Cornelius Evazan, but Rogue One shows they had an even crazier month than fans ever realized. Jyn bumps into the two on Jedha as she and Cassian are picking their way through the crowd. Barking out what is apparently his catchphrase, Evazan (here played by Michael Smiley) and his pal go on their way, avoiding the destruction of Jedha City by a matter of hours... only to meet the working end of a lightsaber on Tatooine. 16. "May The Force of Others Be With You"
Before Jyn is actually called to by Chirrut directly, he can be overheard giving well-wishes to the people passing by - uttering a modified version of the famous blessing: "May the Force of others be with you." It might sound like a small tweak, or be missed entirely, but the "The Force of others" goes back to the first drafts of Lucas's original Star Wars screenplay. It originated as a saying or expression of good luck in the first versions of the story, when the Jedi were simply noble warriors, not superpowered monks. At that time, the idea was simply that "the force of others" recognized a larger, unifying bond between living things. That would eventually be expanded into a literal "Force" that could be manipulated by a select few, but again, the universe's origins are spoken aloud by Chirrut. You may not know its name, but if you've seen the original Star Wars, you know to let a Wookie beat you in a game of it. Dejarik - colloquially known as "space chess" - made its debut onboard the Millennium Falcon, functioning as a ringed board game in which holographic creatures moved from square to square, vanquishing their foe (or falling at their feet). The game made its return when the cast of The Force Awakens boarded the Falcon, but it appears in Rogue One to illustrate just how much rougher some parts of the galaxy were hit by the rise of the Empire. When Jyn and Cassian are brought into Saw's fortress, a group of his soldiers can be seen playing a version of Dejarik with actual carved figures. Hard evidence that Han Solo was a seriously devoted fan of the game. As yet another nod to the original Star Wars trilogy (or, perhaps, the much-maligned Star Wars Holiday Special), a game of Dejarik isn't the only easter egg to watch out for in Saw's desert stronghold. Along with the playing extremists, a small hologram of a Twi-lek dancer can be seen on a table. It's hard to tell if it's actually taken from footage of Return of the Jedi, but it would make sense, considering the lengths already taken to expand the original sequence in Jabba's Palace. 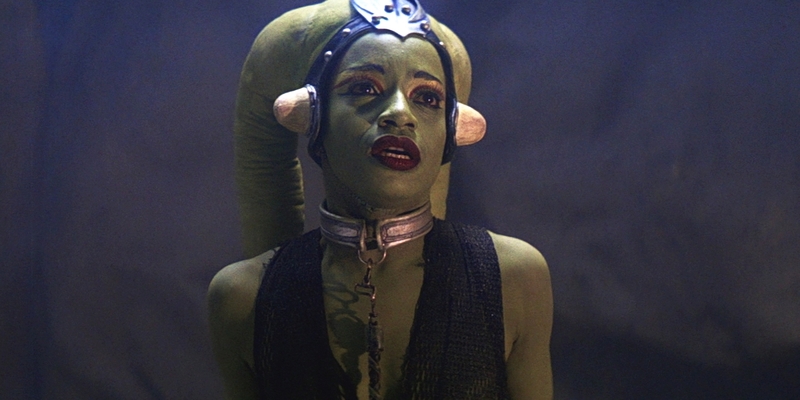 Known in the mythology as 'Oola,' that Twi'lek dancer was played by Femi Taylor - a minor (but memorable) character who got added screen time in the controversial "special edition" of the film. Taylor returned to film additional scenes for that release... but they still ended with her being tossed to the rancor for Jabba's amusement. Far from an easter egg, since it's specifically called out by the key characters, this added detail is actually the most significant connection between Rogue One and A New Hope (if not the entire Star Wars series as a whole). Ever since the movie hit theaters in 1977, fans and critics enjoyed debating the logistics of the Death Star and its mind-numbingly idiotic design flaw: fire a proton torpedo down a thermal exhaust port, and the entire space station will detonate. An explanation is finally offered in Rogue One, but not as a prequel-esque means of simply explaining away a plot hole. Instead, the design flaw is intentionally built into the design by Galen Erso once he realizes that there's no stopping the Empire's pursuit of a planet-killing weapon. He left the door open for his daughter, Jyn, to take advantage. And in passing that weakness on to the Rebels, Galen's plan was executed perfectly. Director Gareth Edwards has gone on record citing over a dozen films that influenced his version of the Star Wars universe, ranging from science fiction to fantast and Vietnam War epics. He's also singled out Ridley Scott as one of his biggest influencers (like many directors of his generation), but the connection goes far beyond the "used future" aesthetic of both George Lucas and Scott's sci-fi. When the heroes head to the planet Eadu to rescue/assassinate Jyn's father, they wind up descending into a rocky, rainy, and oppressively dark series of canyons. If it feels familiar, it's by design: Edwards has stated that the design of Eadu is a direct homage to the setting of Ridley Scott's Alien. The planet may possess different dangers than the Xenomorphs of LV-426, but picturing the events taking place alongside eachother isn't too much of a stretch. Even though fans had decades to ponder the injuries that led to Anakin Skywalker becoming the half-machine Darth Vader of the later films, actually seeing him receive those injuries - at the hands of his mentor, no less - is a hard thing to forget. The loss of his limbs to Obi-Wan's lightsaber happened fast enough for most to miss, but the burning lava of Mustafar cooking his skin... yikes. Apparently, it's a trauma that Vader has internalized, as Rogue One includes a sequence set in the fallen Jedi's own palace. The idea of Vader having a castle-like stronghold of his own was tossed around in the original plans for the original trilogy films, but the location is the key: Anakin Skywalker built his home on the very site he was dismembered, burned, and left for dead. In that same sequence, it's hard to not notice that the version of Vader giving a stern talking-to to Orson Krennic is... well, a bit less polished than fans might remember. We're referring mainly to his costume, as the clear edges of his helmet, chestpiece and cape don't quite meet today's expectations for blockbuster filmmaking. It's by design, of course, since that's exactly how Vader first appeared in the original Star Wars. Later films would iron out the creases, overlap seams, and replace his helmet's lenses with black (not red) plastic. You have to admire the filmmakers for sticking to the same limitations that Lucas did in Revenge of the Sith, embracing the less sophisticated chest panel as a limitation of the technology apparently available to Vader at the time. As an added bonus for fans of modern space operas, it turns out there's more than a spiritual connection between the Star Wars saga and Marvel's own spacefaring outlaws, the Guardians of the Galaxy. While James Earl Jones once again returns to voice the part of Darth Vader in a handful of scenes, the actor actually wearing the armor on set is the six-and-a-half-foot-tall Spencer Wilding. A veteran of films like Batman Begins and Wrath of the Titans, Wilding is more recognizable than most Hollywood stuntmen/actors thanks to his appearance as the Kyln prison guard who gets a little too interested in Star-Lord's Sony Walkman. Fans are free to imagine Vader's brutal assault at the film's end as vengeance for his humiliation at Peter Quill's hands... but that fight work was likely performed by stuntman Daniel Naprous. In what may be the most entertaining adherence to fan service, Rogue One's firing of the Death Star sticks painfully close to the procedures, camera shots, and sounds of the original film - right down to the flipping of switches and pressed buttons that lead to the superweapon's discharge. The strangest moment of all is when a pair of Death Star technicians must lean away from the green laser, covering their eyes in lieu of protective goggles (or a railing, for that matter). Rogue One includes that very same shot for both firings of the weapon, giving fans two chances to see Star Wars Episode VIII director Rian Johnson and producer Ram Bergman in a cameo role. A cameo that, due to the connected timelines, cements the two filmmakers as certified supporting characters in the original Star Wars. Since he doesn't play a pivotal role in the events of the film, there's a good chance that audiences will see Mon Mothma debating the strategies of the Rebel Alliance alongside a bearded, white-haired man and simply think that... it feels right. But the character in question isn't just anyone, and it isn't a new character, either. The Rebel leader is General Jan Dodonna, portrayed in the original movie by Alex McCrindle (he's the one who aids Leia in placing the medals on our heroes at the movie's close). He's brought to life not through CG, like some other returning faces, but by actor Ian McElhinney. McElhinney will be best known to fantasy fans for his role as 'Barristan Selmy' in HBO's Game of Thrones. 6. "I Have a Bad Feeling About This"
It's the Star Wars signature above all others - second only to the infamous Wilhelm Scream - and it turns out in the galaxy far, far away, people have been having "bad feelings about this" even before Luke, Leia and Han joined forces. The catchphrase has been uttered in every film as a means of practically inviting misfortune - a detail that the cast of Rogue One seems to know all too well. This time, it's K-2SO who voices the concern as he, Jyn, and Cassian begin to make their way into the archives tower on Scarif. Before he can say it, however, both Jyn and Cassian silence the droid. It's a knowing wink to the films that came before, while managing to make a meta joke of its own. There's a line between homage and recreation, and Rogue One may be the first Star Wars film to cross it - or be given the license to do so. As the Rebel Fleet arrives at Scarif to offer support to Jyn's team, fans are treated to a roll-out of fighter squadrons just days away from the biggest battle of their lives (and for some of them, their last). Aside from using radio chatter lifted from the first movie to bring this film's Red and Gold Squadrons to life, the filmmakers restored footage of the squadron leaders themselves, most notably actors Drewe Henley (Red Leader Garven Dreis) and Angus MacInnes (Gold Leader Jon Vander). The shots aren't difficult to spot, and help complete the sensation that for these veteran pilots, Scarif and Yavin were just another day at the office. Aside from the Squadron leaders, individual pilots are also singled out (especially the new Blue Squadron). Unfortunately, not all of them make it out of the battle... but the legacy of at least one of them lives on. Not only in helping secure the Death Star plans, but for helping to explain a bit of a plot hole in the original film. Nobody thought twice about seeing Luke Skywalker join the Rebel fighters as part of his heroic journey at the time, but eventually, fans began to wonder exactly why Luke was able to slot himself in as 'Red 5' when a more experienced 'Red 6' is also shown in the battle. Since audiences can now see the previous 'Red 5' killed in the battle above Scarif, the opening on the squadron is explained (even if we wish we knew a bit more about the pilot Luke replaced). It just wouldn't be a blockbuster space battle without some easter eggs in the form of familiar spacecraft. This time around, there's the obligatory shot of a Rebel Blockade Runner/Tantiv IV, the same design of ship that Princess Leia first entered the Star Wars universe aboard (the very first one seen, period). But the presence of said ship actually makes sense, given that it's present at the end of the battle - the other easter egg is a bit more intentional. Keep an eye out for the signature alignment of rear lights, and you'll be able to make out the Ghost - the home of the Star Wars Rebels cast. Fans can debate which of the original heroes may have flown the ship into the battle, or if the ship itself was simply re-purposed for a more frontline assignment. As Bail Organa delivers his final words, heading back home to Alderaan with his daughter in waiting to deliver the Death Star plans to the Rebels, he utters a line audiences should pay close attention to. As he leaves the scene, he addresses "Captain Antilles" nearby. While most fans might assume he's carrying on a conversation with Wedge Antilles (definitely the better known pilot to bear such a name), the more likely figure is Captain Raymus Antilles. As the pilot of the Tantive IV, Raymus would be the one taking the orders from Organa, entrusted with both the Rebellion's most valuable asset, and his own. The reason it matters is that Captain Antilles ultimately failed in that mission, being captured by Darth Vader, and dying in his grip to protect the location of Princess Leia. Since his contribution was so small, it only seems right to give him at least a shout out. The prequel nature of Rogue One is brought completely to a close when the final sequences of the film see the Death Star plans escape the clutches of Vader by a matter of inches, and be hand delivered to Princess Leia on the bridge of the Tantive IV. More CG is used to portray a young Carrie Fisher, but even though the shot is just one word and a few seconds long, an actress was used to ground the performance. Audiences may not know actress Ingvild Deila by name, but this is technically her second blockbuster role for Disney, having appeared alongside Robert Downey, Jr. as an internet "Hub" tech in The Avengers: Age of Ultron. So there you have it, our breakdown of each and every easter egg, Star Wars connection, and hidden detail in Rogue One: A Star Wars Story. If you've spotted anything we've missed, or have questions unanswered, let us know in the comments!